Tax time is a stressful time of year for many individuals and businesses. Given the complexity of the ever-changing laws and the difficulty of interpreting them, you need a tax advisor who not only can ensure you’ve complied with the law, but who can help you claim valuable deductions and credits you may have never suspected. Our firm goes out of its way to reduce the burden of paying taxes for all filers. We pledge not only to prepare your tax returns in the best-informed, most ethical manner possible, but also to work with you year-round as needed to plan a strategy that will minimize your total tax burden. We are qualified to prepare all federal, state, and local tax returns for individuals, corporations, partnerships, and fiduciaries. Once you have trusted us to handle your tax and accounting services, trusting us to handle your payroll needs is the next logical step towards simplifying your business life. We provide a comprehensive payroll service customized for your specific needs—giving you flexible personalized service from our knowledgeable staff. Our service includes check printing, direct deposit of paychecks, electronic tax payments and tax filings, complete compliance, and more. You will receive all the payroll reports you need to run you business most efficiently, and you will also get personalized professional advice on all payroll matters for your firm. We use the latest accounting procedures and techniques in conjunction with the latest technology to provide first rate accounting services. The extent of our accounting services is determined by the needs of our clients. We can provide trivial services such as data entry and bookkeeping or completely overhaul an accounting system, but this is up to the discretion of the client. 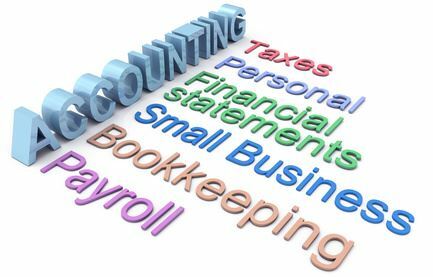 Our accounting services encompass many aspects of typical business operations, such as: evaluating, examining, and analyzing services on financial statements, bookkeeping services, development of corporate structures, reviewing of asset, liability, equity, revenue, and expense accounts, and preparation of quarterly and annual, payroll, sales and use, and commercial rent tax returns for sole proprietorship, corporations, partnerships, estates, and trusts.